Say it isn't so JERRY! Paul VanDenburg was complaining about the state of the city, state,and country. Put your money where your mouth is Paul,and run for mayor! Or, Kristi now is your time to jump in there, and bring your FB fans. I think our "AOA" Mary would be the best Mayor! For all those tweeting about what a great job Jennings did, either they don't understand basic finance (quite possible) or they are lying to advance their own agendas (very possible). It is no coincidence that Tuesday morning Cuomo essentially announced that Albany would have to deal with a restructuring board next year and Tuesday evening Jerry quit. Cuomo even called Jerry out on it by specifically mentioning "the past 20 years" in reference to "the dance" that Albany has been playing with its finances. The music has stopped. And Jerry has left the building. "For the past two years, Albany has closed its budget with $7.8 million spin-ups on state payments in lieu of taxes for the Empire State Plaza. "That's the dance that we've been doing for the past 20 years, and what we want to stop," Cuomo said. "If Albany wants assistance, they're going to have to come and talk to the panel about a real restructuring plan. If the state is to give assistance, it's going to be pursuant to that plan." I hope that I am not the only citizen of Albany who is infuriated by the accepted notion that winning the Democrat party primary is tantamount to being elected Mayor. Why should we leave it in the hands of traditional politics? As citizens of our city, we definitely have an opportunity to put a non-traditional candidate on the ballot with half a chance of being elected, but only as a city united. If the ballot fills with a dozen would-be reformers with a dozen different platforms, we simply hand the election back to the democrats. We need to put forth candidates for Mayor and city council positions all united by a common platform, established by the community, and which the community can stand behind. I suggest we form a new party-- the Albany Party--in which we ignore longstanding political and social differences, and instead hold a series of public debates aimed, not at identifying a candidate, but identifying a series of city-specific policies, one at a time. As a group, we can establish the most desired position on each issue one at a time, then find a candidate to fit the platform we have generated, instead of finding a platform to fit the candidate. It's about time. Albany has so many things going for it, but the government and the mayor have squandered these opportunities for more than 20 years. Compared to other cities that are seats of government and that also have major universities, Albany's livability ranks very low. It's time to have a real downtown, protected bike paths, historic preservation, and affordable housing and neighborhoods that are actually pleasant to live in. In 1990, I received a bill from the City of Albany for a bunch of trash I had cleaned out in a house I had bought. 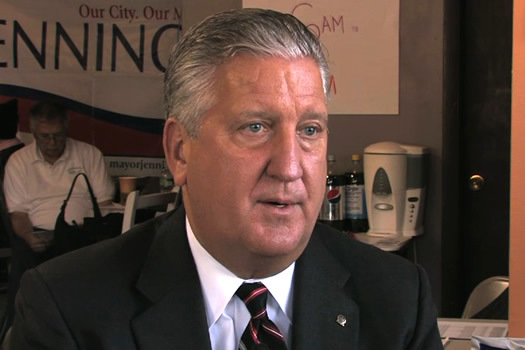 I wrote Mayor Jennings a letter disputing the bill. Within days, I got a call from one of his representatives telling me that the bill would be cancelled and that the Mayor appreciated my efforts to clean up my property. I never got the opportunity to thank him - so - thank you Mayor Jennings. @Barold. That is a really nice story but I think you either made a typo or have your dates confused. Jennings wasn't in office in 1990. He became mayor in 1994. "Kathy has significant private sector experience, most recently as a member of the senior management team at Intermagnetics General Corporation (Nasdaq: IMGC), which is now a division of Philips Medical Systems. Prior to being acquired by Philips in 2006, IMGC had annual sales in excess of $300 million. As vice president, general counsel and corporate secretary, Kathy participated in strategic planning and key decision-making regarding the direction of the business. She also advised the company and its board of directors on corporate governance, securities law compliance, mergers and acquisitions, labor and employment issues and other legal matters." Well at least we can sleep easy knowing our left guard like Citizen Action and Barbara Smith will go back to bat in 2013 for the working class candidate amirite?